The anniversary of the EZLN’s uprising is a chance to reflect on the Zapatista movement’s achievements and lessons that are still relevant today. Jan. 1 marks the 22nd anniversary of the Zapatista uprising and more than 30 years since the formation of the Ejército Zapatista de Liberación Nacional (Zapatista Army of National Liberation, EZLN). On January 1, 1994, the EZLN captured the world’s imagination when it rose up to demand justice and democracy for the indigenous peasants of southern Mexico. Since that brief armed insurrection, the EZLN has become known more for its peaceful mobilizations, dialogue with civil society, and structures of political, economic, and cultural autonomy. Over the past three decades, the Zapatista movement has won significant changes in its own territory and has inspired other social movements in Mexico and around the world, offering a number of key lessons that are still relevant today. The date of the Zapatista uprising was chosen for its symbolic importance – as it was the day the North American Free Trade Agreement (NAFTA) went into effect. The EZLN was one of the first popular movements to recognize neoliberalism as a menacing new stage of global capitalism and called NAFTA a death sentence for the indigenous peasants of Mexico. Over the past two decades, the impact of the Zapatista movement can be seen at the local, national, and international level. As night fell on Dec. 31, 1993, the armed forces of the EZLN had begun to gather. It was an army made up almost entirely of indigenous people, and about a third of the soldiers were women. As dawn broke on New Year’s Day, Zapatista troops occupied seven towns throughout the eastern half of Chiapas, including San Cristóbal de las Casas, a quaint colonial city nestled in the misty highlands of Chiapas and a major tourist destination. The Zapatistas occupied San Cristóbal for less than 48 hours. They stayed long enough to read their declaration of war from the balcony of the municipal palace, but slipped away in time to escape the full brunt of the Mexican military. 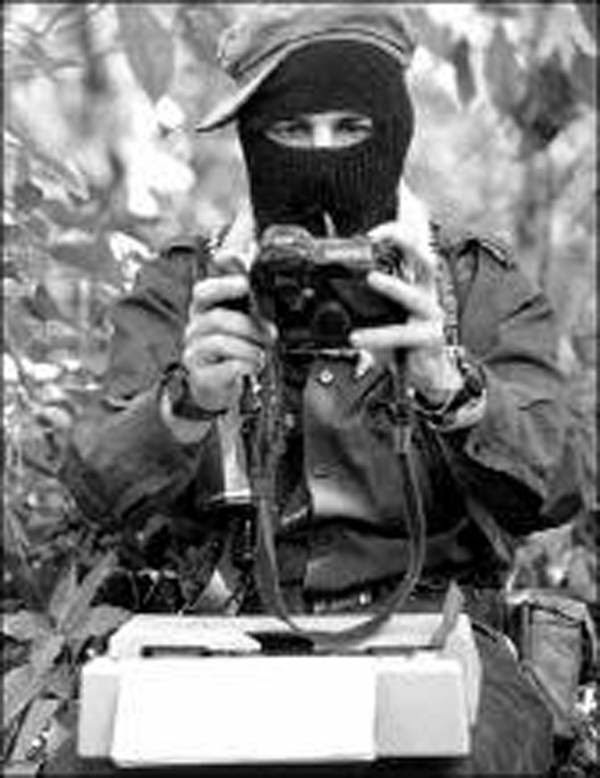 The uprising would quickly transform the EZLN into one of the most well-known social movements in the world, and one that would inspire an extraordinary level of solidarity. Over the past two decades, the impact of the Zapatista movement can be seen at the local, national, and international level. Land takeovers carried out after the 1994 uprising — where large ranches were occupied by the Zapatistas and reapportioned to landless peasants — impacted the distribution of wealth in Chiapas and continue to affect living conditions for Zapatista villages farming on reclaimed land. The Zapatista structures of indigenous autonomy have meant that rural villages in Chiapas have gained access to rudimentary health care and education. They exercise self-determination through local and regional governments, and generate resources back into their communities through economic cooperatives that organize the production of goods. At the national level, the EZLN and the Mexican government signed the San Andrés Peace Accords in 1996. Although never implemented by the Mexican government, the San Andrés Accords recognized indigenous rights, promised indigenous autonomy, and created a framework that the Zapatistas and other indigenous groups throughout Mexico would implement on their own. The Zapatista movement arguably helped bring an end to 70 years of one-party rule in Mexico when the Partido Revolucionario Institucional (Institutional Revolutionary Party, PRI) lost the presidential elections in 2000. The EZLN continues to be an important reference point for social movements in Mexico today, such as the protest movement that emerged after the disappearance of forty-three students from a rural teachers’ college in 2014. Around the world, the Zapatistas catalysed a wave of solidarity that inspired a generation of young activists to organize for social justice in their own contexts. International gatherings organized by the EZLN fostered the burgeoning global justice movement. Events inspired or influenced by the Zapatistas include the World Social Forum, an annual global forum for grassroots activists and organizations, and demonstrations against global capitalism, such as the 1999 protests in Seattle against the World Trade Organization. With its ideological critique of neoliberalism and its internal emphasis on participatory democracy, the EZLN was a precursor to the Occupy and “We Are the 99 Percent” movements that emerged almost two decades after the Zapatista uprising. The Zapatista movement also offers a viable example of local alternatives to global capitalism. The economic cooperatives in Zapatista communities, for example, are strengthening a local and regional economy based on collective effort and the wellbeing of the community, rather than competition and profit. Anyone who is 21 years old or younger was born after the Zapatista uprising, and many young people today have not even heard of the EZLN. In addition to understanding the significant achievements in Zapatista territory and their ripple effect around the world, this anniversary is also an opportunity to reflect on the qualities of the Zapatista movement that made it such a compelling and successful social movement. One such quality is the EZLN’s remarkable ability to draw from different historical, political and cultural traditions. The founding members of the EZLN were Marxist guerrillas who sought to overthrow the Mexican government through armed struggle. In Chiapas, however, they encountered a centuries-long history of indigenous resistance and a well-organized peasant movement fighting for land reform. They also encountered the influence of the Catholic Diocese of San Cristóbal and several Maoist organizations. Instead of holding onto a rigid ideological orientation, the EZLN’s leadership in those early years learned from these different traditions and began weaving them into a political praxis we now know as Zapatismo. This fluidity can also be seen in the blending of indigenous traditions and Western knowledge within the structures of indigenous autonomy. The autonomous health care system, for example, integrates knowledge of medicinal plants and includes traditional healers like midwives and bone-setters, but also makes use of Western medicine and relies on doctors to train the community health promoters. Another important element of the Zapatista movement is women’s leadership and the commitment to women’s rights and equality. Women’s involvement in the EZLN has helped shape the Zapatista movement, which, in turn, opened new spaces for women and led to dramatic changes in their lives. When the EZLN began organizing in the rural villages of Chiapas, women there were experiencing an extraordinary level of violence and discrimination. But gender roles were radically redefined in the context of the Zapatista movement, as women became guerrilla insurgents and political leaders, healers and educators, and members of economic cooperatives. The tremendous changes in women’s lives include public roles of leadership and participation in community affairs, the ability to choose their romantic partner and decide how many children to have, and a significant decrease in alcohol consumption and domestic violence. The great strides made towards women’s liberation within the Zapatista movement offer an array of insights about how gender transformations can be achieved. They had the courage to declare war on the Mexican government, to take on global capitalism, and to ask themselves what it would mean to dismantle patriarchy in Zapatista territory. None of this, however, has stopped the Zapatistas from dreaming big dreams or taking on the most intimidating of foes. They had the courage to declare war on the Mexican government, to take on global capitalism, and to ask themselves what it would mean to dismantle patriarchy in Zapatista territory. If there is one thing about the Zapatista movement I would hope to see contemporary social movements emulate, it would be this combination of humility and chutzpah – the understanding of the enduring nature of this work and the patience and unflinching commitment that comes along with it.